Pseudomonas aeruginosa, an increasingly prevalent opportunistic pathogen, utilizes a type III secretion system for injection of toxins into host cells in order to initiate infection. A crucial component of this system is PcrV, which is essential for cytotoxicity and is found both within the bacterial cytoplasm and localized extracellularly, suggesting that it may play more than one role in Pseudomonas infectivity. LcrV, the homolog of PcrV in Yersinia, has been proposed to participate in effector secretion regulation by interacting with LcrG, which may act as a secretion blocker. Although PcrV also recognizes PcrG within the bacterial cytoplasm, the roles played by the two proteins in type III secretion in Pseudomonas may be different from the ones suggested for their Yersinia counterparts. In this work, we demonstrate by native mass spectrometry that PcrV and PcrG expressed and purified from E. coli form a 1:1 complex in vitro. Circular dichroism results indicate that PcrG is highly unstable in the absence of PcrV; in contrast, both PcrV alone and the PcrV:PcrG complex have high structural integrity. Surface plasmon resonance measurements show that PcrV interacts with PcrG with nanomolar affinity (15.6 nM) and rapid kinetics, an observation which is valid both for the full-length form of PcrG (residues 1–98) as well as a form which lacks the C-terminal 24 residues, which are predicted to have low secondary structure content. PcrV is a crucial component of the type III secretion system of Pseudomonas, but the way in which it participates in toxin secretion is not understood. Here we have characterized the interaction between PcrV and PcrG in vitro, and shown that PcrG is highly unstable. However, it associates readily with PcrV through a region located within its first 74 amino acids to form a high affinity complex. The fact that PcrV associates and dissociates quickly from an unstable molecule points to the transient nature of a PcrV:PcrG complex. These results are in agreement with analyses from pcrV deletion mutants which suggest that PcrV:PcrG may play a different role in effector secretion than the one described for the LcrV:LcrG complex in Yersinia. Pseudomonas aeruginosa is an opportunistic, Gram-negative bacterium which infects immunocompromised individuals, such as those suffering from AIDS, cancer, and severe burns; in addition, it is highly prevalent in the lungs of patients with cystic fibrosis (CF), being responsible for a large number of deaths in such cases . P. aeruginosa, like most other Gram-negative pathogens, employs a type III secretion system (TTSS) to inject toxins into the cytoplasm of contacted host cells . Such a system requires more than 20 different proteins, a number of which are assembled into a "secreton" structure which spans both bacterial membranes and includes a "needle" through which effector molecules travel in preparation for their injection into the target cell [3, 4]. Once through the needle and in the target cytosol, Pseudomonas toxins (ExoS, ExoT, ExoY, and ExoU) disrupt the actin cytoskeleton and signal transduction pathways, eventually causing cell death [5–7]. The control of effector molecule injection involves a complex regulatory mechanism, a critical component of which is PcrV, a 32 kDa protein which has both intrabacterial and extracellular functions [8, 9], much as LcrV, its homologue in the well-studied Yersinia TTS system . Both PcrV and LcrV have been shown to be protective antigens against infection with their respective pathogens [9, 11, 12], and LcrV is currently in phase II trials as the principal agent of a protective vaccine against plague (caused by Yersinia pestis; ). The expression of both LcrV and PcrV is transcriptionally up-regulated at 37°C upon host infection or in vitro by a decrease in calcium, and the proteins are required for translocation of effector molecules into the target cytoplasm; in Yersinia, a lcrV null mutant cannot translocate effector molecules [10, 14, 15]. LcrV has been shown to interact with LcrG, an 11 kDa cytoplasmic molecule whose proposed function involves blockage of the secretion apparatus through interaction with the secreton macromolecular complex under non-secreting conditions [16, 17]. Interestingly, overexpression of LcrG inhibits effector secretion even in the presence of LcrV , and a LcrG mutant which is incapable of binding LcrV continues to block secretion . Thus, a "titration" model has been proposed in which secretion-prone conditions cause an increase in LcrV expression, which in turn binds to LcrG, unblocking the secreton gate [16, 18]. Notably, the applicability of this model to Pseudomonas is improbable, since ΔpcrV strains are able to secrete effector molecules both under inducing or non-inducing conditions (presence or absence of chelating agents, respectively; ), suggesting that the Pseudomonas secreton gate may not be under the control of the PcrV:PcrG complex, or that the regulation mechanism may be different. Recently, it has been shown that PcrG is capable of complementing a lcrG strain, as well as interacting with LcrV [19, 20]; in addition, preliminary affinity immunoblotting studies have identified an interaction between PcrV and PcrG . However, to date no biochemical characterization of the Pseudomonas PcrV and PcrG proteins, or of the PcrV:PcrG complex, has been made available. Here, we have independently expressed and purified PcrV and PcrG, and isolated a stable PcrV:PcrG complex. Native mass spectrometry has been used to identify the 1:1 nature of the complex as well as the monomeric state of PcrV. Notably, both PcrV and the PcrV:PcrG complex are stable in temperature scanning circular dichroism studies, while PcrG is highly unstable. Surface plasmon resonance results show that the PcrV:PcrG complex associates through rapid kinetics and with nanomolar affinity, but with values that are clearly distinct from those reported for the Yersinia LcrV:LcrG complex. 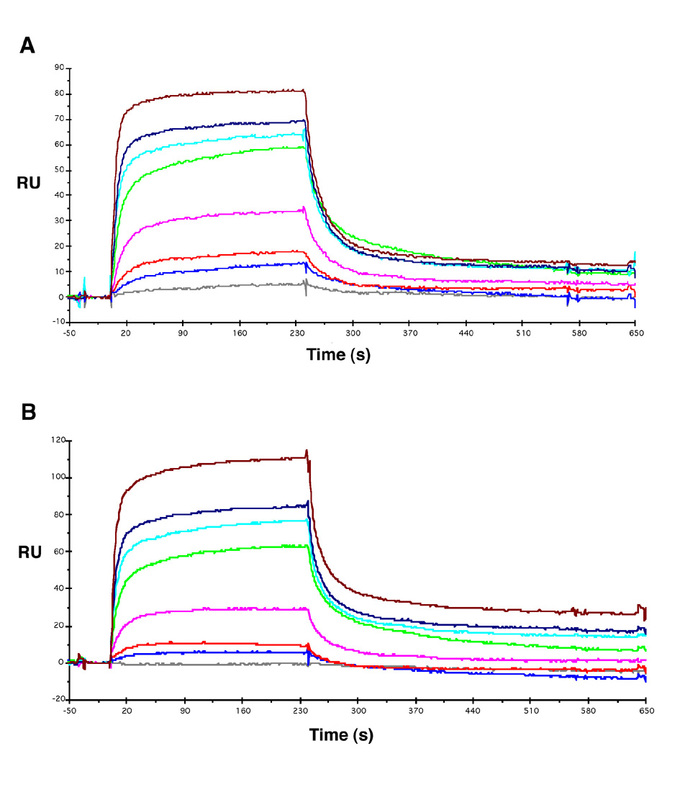 These results support a role for the formation of a transient complex between PcrV and PcrG as a means of regulating type III secretion in Pseudomonas which differs from the titration mechanism proposed for the Yersinia system. PcrV and LcrV, as well as PcrG and LcrG display 42% and 40% sequence identity, respectively (Fig. 1). Secondary structure prediction calculations for PcrV suggest a helical structure, with a coiled coil region ranging from residues 113 to 148 (as calculated by the PHD program). For PcrG, such predictions suggest that the region following residue 74 presents a lower possibility of displaying stable secondary structure; in addition, studies involving the LcrV:LcrG complex suggest that the N-terminal domain of LcrG is responsible for most of the contacts with LcrV . Consequently, in order to independently characterize the functions of the 1–74 and 75–98 regions of PcrG, we overexpressed both full-length (amino acids 1–98) and a shortened version (amino acids 1–74) of the protein. PcrV (32,633 Da), PcrG (1–98; 11,216 Da) and PcrG (1–74; 8,382 Da) were expressed in the E. coli cytoplasm and purified by nickel affinity and gel filtration chromatographies, after which the His tag was removed in the case of PcrV. PcrV eluted from an Amersham S200 gel filtration column in 15.5 ml (which corresponds to an approximate Mr of 38 kDa, based on marker proteins), and native mass spectrometry performed on purified PcrV confirmed that the molecule is monomeric (mass obtained, 32,644 Da). 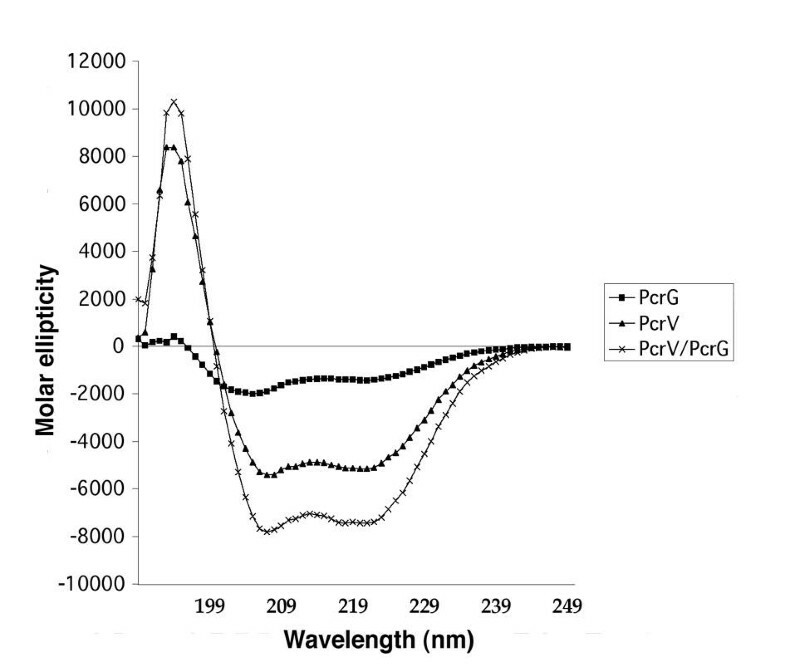 Purified PcrG eluted at 17.4 ml, and when mixed in approximately equimolar amounts, PcrV and PcrG shifted their profiles and co-eluted from a gel filtration column at 14.3 ml. This observation provides clear evidence of the formation of a high affinity complex between the two proteins (Fig. 2). Notably, the 1:1 nature of the PcrV:PcrG complex was confirmed by native mass spectrometry, which yielded a mass value of 43,925 Da (theoretical mass for the complex, 43,910 Da). Sequence alignment between PcrV ( P. aeruginosa ) and LcrV ( Y. pseudotuberculosis ), and PcrG and LcrG. 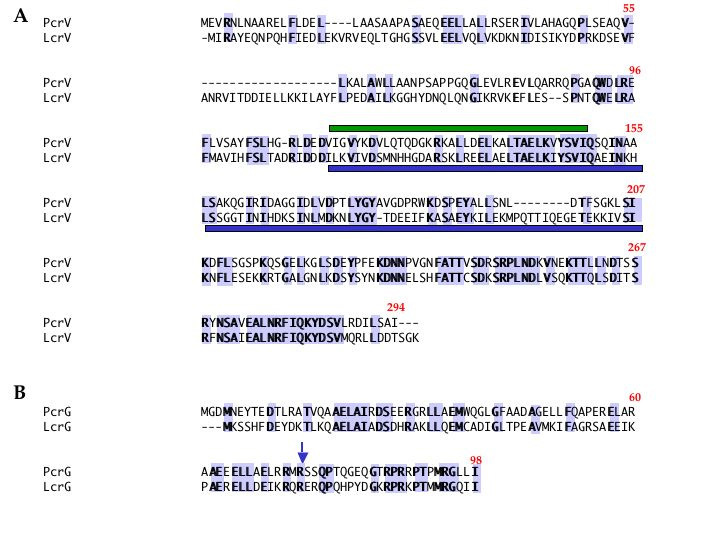 Identical residues are highlighted, and the predicted coiled coil region in PcrV is identified with a green bar. The blue bar represents the major antigenic region of LcrV identified in active and passive immunization studies . The arrow points to the end of the PcrG (1–74) construct. PcrV and PcrG co-migrate in gel filtration. 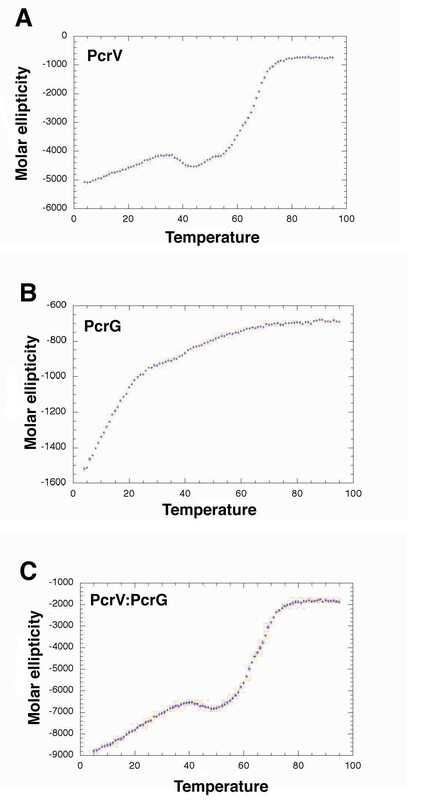 (A) PcrV:PcrG peak fraction after proteins were purified individually and mixed in equimolar amounts prior to gel filtration chromatography; (B) PcrV peak fraction; (C) PcrG peak fraction. 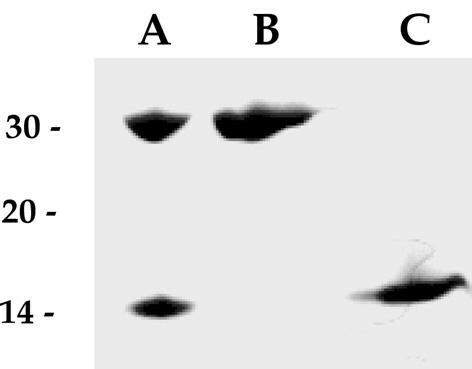 Positions of Mr markers (kDa) are shown on the left side of the gel. Limited proteolytic assays performed on PcrG revealed that a variety of proteases (trypsin, chymotrypsin, elastase, thrombin, and V8) were able to cleave PcrG into small peptidic fragments, suggesting that the protein could be inherently unstable. In addition, initial CD spectra, performed at 20°C, revealed that PcrG had very low ellipticity; measurements performed at 4°C, however, displayed a better signal, suggesting that at low temperature the protein could be slightly more stable. Consequently, CD measurements for PcrV, PcrG, and the PcrV:PcrG complex were all performed at 4°C. The CD spectra of PcrV and the PcrV:PcrG complex exhibit a maximum at 192 nm and minima at 208 and 222 nm, which are characteristic of proteins with α-helical content (Fig. 3). For PcrV, the estimated helical content is approximately 18% (see Materials & Methods). Notably, the estimated helical content for PcrG is 6%, suggesting that the uncomplexed protein, even at 4°C, may be poorly folded. For the PcrV:PcrG complex, however, the estimated helical content is 25%. The presence of an increase in the relative percentage of α-helical content between PcrV and PcrV:PcrG suggests that PcrG may be stabilized by binding to PcrV. CD spectra for PcrV, PcrG, and PcrV:PcrG. Data are represented as molar ellipticity and were recorded at 4°C and 0.35 mg/ml (PcrV), 0.25 mg/ml (PcrG), and 0.25 mg/ml (PcrV:PcrG). Temperature scanning circular dichroism measurements revealed that PcrV unfolds in a cooperative manner, presenting a transition melting (Tm) temperature of 65°C, which is typical of a stable macromolecule (Fig. 4a). PcrG, however, unfolds in a non-cooperative manner, starting to unfold already at low temperatures, and does not display a clear Tm, revealing that the uncomplexed protein has low thermostability (Fig. 4b). Notably, the purified PcrV:PcrG complex displays a high thermostability as shown by cooperative unfolding with an approximate Tm of 65°C (Fig. 4c), as in the case of PcrV alone. Temperature scanning CD spectra for PcrV, PcrG, and PcrV:PcrG. Both PcrV (A) and PcrV:PcrG (C) display Tm values of approximately 65°C, while PcrG (B) does not unfold in a cooperative manner. Interactions between PcrV and PcrG (full-length and 1–74) were studied by surface plasmon resonance using the BIAcore technology. When injected over the surface of the sensor chip, PcrV was found to bind both specifically and in a concentration-dependent manner to immobilized PcrG (Fig. 5a). This set of sensorgrams was best fit to the 1:1 Langmuir binding model with drifting baseline (chi2:0.43). The addition of a drifting term was required to take into account the baseline drift due to buffer injection performed before PcrV injection. The corresponding affinity constant KD, describing the interaction of PcrV with the full length form of immobilized PcrG, was found to be 1.56 × 10-8M. Notably, as shown in Fig. 5b, the kinetics for the binding of PcrV to immobilized PcrG (1–74) were similar to those for PcrG. The best fit of this latter set of sensorgrams was also obtained using the 1:1 Langmuir binding model with drifting baseline. The corresponding affinity constant KD, describing the interaction of PcrV with immobilized PcrG (1–74), was also found to be 1.56 × 10-8 M. The two affinity constants, in the nanomolar range, indicate the formation of a high affinity complex between PcrV and the first 74 residues of PcrG. PcrV binding to PcrG and PcrG (1–74) demonstrated by surface plasmon resonance. Injection of PcrV (2–180 nM, flow rate: 40 μl/min, injected volume: 160 μl) over (A) immobilized PcrG (213 RU); (B) immobilized PcrG (1–74) (548 RU). Non-specific binding to the sensor chip (evaluated on flow cell 1) and the bulk effect due to the buffer were subtracted from the raw data. Although PcrV:PcrG and PcrV:PcrG(1–74) complexes exhibited the same affinity, their association and dissociation rate constants displayed slight differences. PcrV binds more rapidly to full length PcrG than to the truncated form (ka(1–98) = 4.45 × 105 M-1 s-1, ka(1–74) = 3.16 × 105 M-1 s-1), but the dissociation rate from the full length form of PcrG is faster than from PcrG (1–74) (kd(1–98) = 6.94 × 10-3 s-1, kd(1–74) = 4.91 × 10-3s-1). No significant variation in the association phase was observed when PcrV was injected over either form of PcrG at different flow rates, suggesting that mass transfer did not significantly influence these interactions. This confirmed the kinetic analysis that showed no improvement of the fit when a mass transfer term was included in the model. Virulence in Pseudomonas aeruginosa strains has been shown to be highly dependent on the expression of PcrV, a soluble protein which can be found both in the bacterial cytoplasm and in the extracellular region [8, 9]. PcrV is required for lung injury and cytotoxicity, and anti-PcrV antibodies have been shown to be protective against infection, leading to increased macrophage survival in in vitro and in vivo studies. These observations are directly linked to the fact that PcrV is required for the translocation of toxins into target cells, and neutralization of the extracellular form of the protein by antibodies blocks toxin injection and facilitates phagocytosis of Pseudomonas by macrophage cell lines . In Yersinia, the homologous LcrV:LcrG complex plays a key role in type III secretion. LcrG has been proposed to block the secretion apparatus from the inner face of the bacterial membrane, being titrated away from a yet-to-be-determined partner within the secreton by high levels of LcrV transcribed once secretion permissive conditions are in place [16, 18]. In Pseudomonas, however, ΔpcrV mutants are able to secrete effectors in inducing or in non-inducing conditions [9, 24], suggesting that a PcrV:PcrG regulatory mechanism may greatly differ from the well studied LcrV:LcrG process. In this work, we have characterized the PcrV:PcrG interaction by expressing and purifying both PcrV and PcrG in soluble forms, and have shown that they associate in a complex which can be isolated by gel filtration. Native mass spectrometry studies showed that PcrV is a monomeric molecule, and its quaternary structure is thus distinct for that determined for LcrV, which has been reported to be dimeric . In addition, our native mass spectrometry results also show that the PcrV:PcrG complex associates in 1:1 fashion (as does LcrV:LcrG; ), a result confirmed by surface plasmon resonance experiments. Circular dichroism and limited proteolysis studies showed that PcrG is highly unstable, presenting a low level of secondary structure when in unbound form. However, it is stabilized through complexation with PcrV, which is evidenced by a greater amount of α-helical structure in the PcrV:PcrG complex than in PcrV alone. The contribution of PcrG to the overall compactness of the complex may be minimal, however, as seen by the fact that the Tm values are identical for PcrV and PcrV:PcrG. These observations suggest that PcrG may not exist as an unbound molecule within the bacterial cytoplasm. In order to understand the kinetics and binding affinities between PcrV and different regions of the PcrG molecule, we performed surface plasmon resonance studies by flowing PcrV over both full-length PcrG (residues 1–98) as well as a truncated PcrG version (residues 1–74), since PcrG residues 75–98 lack major secondary structural elements in prediction profiles. PcrV associates to and dissociates from either form of PcrG relatively rapidly; this would be expected if the PcrV:PcrG interaction were a transient one, necessary uniquely for the establishment of a regulatory response. In addition, the similarity in kinetic parameters for the interaction of PcrV with both PcrG forms coupled to the fact that binding of PcrV to either form of PcrG presents the same affinity constant (KD 15.6 nM) suggests that the C-terminal region of PcrG (residues 75–98) does not participate in complex formation (an observation which is in agreement with results obtained by Matson & Nilles  for the LcrV:LcrG interaction). The fact that PcrV is able to bind to such an unstable molecule as PcrG with nanomolar affinity suggests a key role for the PcrV:PcrG complex in regulation of type III secretion in Pseudomonas. Most affinity constants determined by surface plasmon resonance in this work differ from those determined for the Yersinia LcrV:LcrG interaction by the same technique . The ka reported for the formation of the LcrV:LcrG complex is 100 times lower than that found for the Pseudomonas proteins (4.38 × 103 M-1s-1 versus 3.16–4.45 × 105 M-1s-1). In addition, the KD values reported for the PcrV:PcrG complex are approximately 10 times lower than those measured for the LcrV:LcrG interaction (approximately 140 nM). Consequently, PcrV and PcrG associate more rapidly and with a higher affinity than their Yersinia counterparts, reinforcing the theory that the mechanisms of secretion regulation in Yersinia and Pseudomonas may be distinct. In order to characterize this difference, further analysis of PcrV:PcrG interactions, as well as the phenotypic analysis of ΔpcrG strains, will provide essential information. PcrV is a key component of the type III secretion system in Pseudomonas, and its interaction with PcrG in the bacterial cytoplasm may be a crucial factor for toxin secretion. PcrV, a monomeric molecule, forms a 1:1 complex with PcrG. Interestingly, PcrG is a highly unstable molecule, as seen by temperature scanning circular dichroism, but forms a stable complex with PcrV. The two molecules associate with rapid kinetics and form a high affinity complex (KD 15.6 nM); in this association, the C-terminal region of PcrG does not play a role. In Yersinia, LcrV is a dimeric molecule which associates with its cognate LcrG with a KD that is 10 fold weaker. Such distinctions are in agreement with results from the phenotypic characterization of pcrv mutant strains, which suggests that the regulatory role played by the PcrV:PcrG complex is different from the one proposed for its Yersinia counterpart. DNA fragments encoding full-length PcrV and full-length PcrG (residues 1–98; henceforth referred to as PcrG) were amplified by PCR using QBioTaq polymerase (QBiogene), cloned in pGEM-T (Promega) and verified by double-stranded sequencing. The template plasmid for all reactions was pIA60, a pUC18 derivative containing operons pcrGVHpopBD and exsCBA on an 8 kb Eco RI fragment isolated from the P. aeruginosa strain CHA . Nde I-Bam HI fragments were cloned into pET15b (Novagen), generating pET/V and pET/G and placing the coding region for a six histidine sequence (6His tag) upstream from the coding regions of PcrV and PcrG, respectively. During this study, we found that PcrV contained a Ser225Arg mutation when compared to the available sequence. This change was confirmed by direct sequencing of the PCR product obtained with genomic DNA as a template, suggesting that the change is strain-specific. The vector expressing the short form of PcrG (residues 1 to 74), pcrgs/pHIS8, was constructed by PCR amplification of the desired region from construct pET/G (described above). A NcoI-BamHI fragment was subsequently cloned into vector pHIS8 upstream from a polyhistidine-encoding tail. PcrV production was performed as in  with minor modifications. Briefly, expression of PcrV was induced in E. coli strain BL21(DE3) in Terrific broth (Sigma) with 1 mM isopropyl-beta-D-thiogalactopyranoside (IPTG) for 5 h at 37°C. Cells were harvested by centrifugation and lysed by sonication in lysis buffer (50 mM Tris-HCl pH 8.0, 0.5 M NaCl, 5 mM imidazole, 10 mM benzamidine). The supernatant was cleared by centrifugation at 18,000 rpm and applied to a 1.5 mL Ni NTA agarose column (Qiagen). Non-specifically bound protein was washed off the resin with 20 column volumes of wash buffer (50 mM Tris pH 8.0, 0.5 M NaCl, 20 mM imidazole). PcrV was then eluted with 8 column volumes of elution buffer (50 mM Tris pH 8.0, 0.5 M NaCl, 250 mM imidazole), concentrated on a Centriprep concentration device (Amicon), and loaded onto a gel filtration column (Amersham HiLoad 16/60) previously equilibrated in 25 mM Tris pH 8.0, 50 mM NaCl, 1 mM EDTA. The hexahistidine tag was removed by adding thrombin at a 1:400 ratio (w/w) for 1 hour; the reaction was stopped with 1 mM PMSF. For PcrG and PcrG (1–74), most purification steps were similar, with the exception that protein expression was induced by adding 1 mM IPTG to bacterial cultures at 22°C for an overnight period. Either form of isolated PcrG was clearly less stable than PcrV, presenting signs of degradation after a few days of storage. Generation of the PcrV:PcrG complex was performed by mixing approximately equal ratios of PcrV and PcrG, followed by gel filtration chromatography. Protein concentration was determined by UV absorption, and pure protein was stored at 4° for up to 2 weeks. PcrV, PcrG and the PcrV:PcrG complex were diluted to 0.35, 0.25 and 0.25 mg/mL, respectively, and dialyzed against 20 mM phosphate buffer, pH 7.0 for 16 hours. CD measurements were performed on a Jasco J-810 spectrometer equipped with a PTC-423S temperature controller. Melting curves were performed at 222 nm with a temperature slope of 1°C/minute from 4° to 95°C. Data was processed using Spectra Manager and Spectra Analysis version 1.51 (Jasco). A CD spectrum of the phosphate buffer alone was subtracted from all subsequent CD spectra. The measured ellipticity was converted into molar ellipticity. The percentage of helical content was estimated from θ222nm by assuming that a value of -33,000 degrees.cm2.dmol-1 corresponds to 100% alpha helical content . Binding analysis was performed using a BIAcore 3000 system (BIAcore AB, Uppsala, Sweden). PcrG and PcrG (1–74) were covalently coupled to CM5 sensor chips (Research grade) via amine coupling (amine coupling kit, BIAcore AB). Initially, the carboxymethylated dextran surface was activated by a 50 μl-injection of a mixture of 0.2 M N-ethyl-N'-(diethylaminopropyl)-carbodiimide and 0.05 M N-hydroxysuccinimide. PcrG was then injected in 10 mM maleate buffer pH 6.0 containing 25 mM sodium chloride. Activation time, PcrG concentration and contact time were adjusted according to the desired extent of immobilization. Remaining N-hydroxysuccinimide esters were blocked by the injection of 1 M ethanolamine hydrochloride pH 8.5. All immobilization steps were performed at a flow rate of 5 μl/min. The control flow cell was prepared by carrying out the coupling reaction in the presence of coupling buffer alone. It was used to obtain control sensorgrams showing non-specific binding of PcrV to the surface. Sample buffer was injected over the different flow cells to monitor refractive index changes. Control sensorgrams were then subtracted from sensorgrams obtained with immobilized PcrG in order to yield true binding responses. Binding assays were performed at 25°C in 10 mM HEPES buffer pH 7.4 containing 0.15 M NaCl and 0.005% (v/v) P20 surfactant (HBS-P buffer, BIAcore AB, Uppsala, Sweden). PcrV was dialyzed against HBS-P buffer and injected at several concentrations and different flow rates over immobilized PcrG and PcrG (1–74). The surface was then regenerated with a pulse (30 μl) of 3 M guanidinium chloride. Kinetic constants were calculated by non-linear fitting to the association and dissociation curves (BIAevaluation 3.1 software). Apparent equilibrium dissociation constants (KD) were then calculated as the ratio of kd/ka. Non-covalent mass spectrometry measurements were performed by using a Q-TOF Micro mass spectrometer (Micromass, Manchester, U. K.) equipped with an electrospray ion source operating with a needle voltage of 2.7 kV and sample cone voltage of 30 V. PcrV and PcrV:PcrG were prepared in 15 mM ammonium bicarbonate pH 7.8 at a final concentration of 20 μM and were continuously infused at a flow rate of 10 μL/min. The mass spectra were recorded in the 1500–3700 mass-to-charge (m/z) range. Data were acquired in the positive mode and calibration was performed using the multiply charged states produced by a separate injection of heart horse myoglobin dissolved in water/acetonitrile (1:1-v/v) with 0.2% formic acid. Data were processed with MassLynx 4.0 (Micromass). The authors would like to thank Otto Dideberg, Thierry Vernet, and Michel Satre for their continuous support. This work is partly supported by a grant from the French Cystic Fibrosis association "Vaincre la Mucoviscidose" (to I.A.). A.D. is an EMBO Young Investigator and a recipient of an ACI Jeunes Chercheurs grant from the French Ministry of Research. MN subcloned PcrG (1–74), purified the molecules, carried out biochemical and circular dichroism studies, and participated in SPR experimentation. SRB conceived of and performed the SPR experiments. AMDG participated in protein purification and characterization. JC participated in molecular biology efforts under the supervision of IA. DLm and DL performed native mass spectrometry experiments. AD conceived of the study, supervised the work, and drafted the manuscript.